This is a movie from 1928 by an unknown director (Bryan Foy) with unknown stars. But it was, as history tells us, the first film with an entirely synchronized dialogue track. So I watched it with thanks to a nice print on Turner Classic Movies. I watched LIGHTS OF NEW YORK (1928) on 1.7.15. It was my first viewing of the film. The JAZZ SINGER is credited as the first sound film thanks to Al Jolson’s famous ad-lib and a scene with his mother. While films with dialogue were not unprecedented in other places throughout the world before that 1927 film, that is the movie which most film historians credit with the modern turn towards the possibility of the ‘talkie’. A couple other films came out over the next year with varying levels of microphone recorded dialogue. 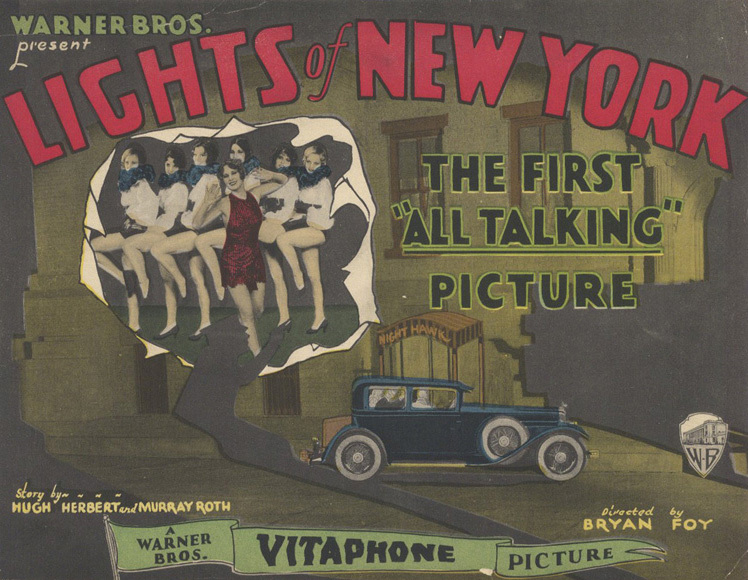 Then, in July of 1928, LIGHTS OF NEW YORK premiered. It was the first film to be a top-to-bottom talkie. Director Bryan Foy was an unknown, but he was allowed to turn this intended short into a feature length movie. While it doesn’t enjoy the popular familiarity as a filmic landmark that JAZZ SINGER does, LIGHTS OF NEW YORK does stake a similar claim to history. The story is not complex. A couple of saps buy a barber shop from a couple of crooks who have been using it as a front for a speak easy. The saps want out, but the crooks have already helped aid in the killing of a police officer, so they turn it over voluntarily to our saps. A night club is introduced, run by a guy called The Hawk (Wheeler Oakman). We get a bunch of time-filler type dancing and singing before learning that The Hawk had plenty to do with the killing of that cop as well. To watch this movie is to put aside modern concepts of dialogue and sound and enjoy it for its history. This blog will always score a film based on modern movie standards and from a perspective of the entirety of film’s history. The acting in this movie cannot, possibly, hold up to the acting of modern day. Heck, it can’t even hold up to the acting of a few years later. The actors appearing in LIGHTS OF NEW YORK were doing something nobody else had done. To act, both physically and vocally, a full length feature in front of a camera was something people had never done in the entirety of mankind. A certain level of woodenness and overacting can be forgiven. That said, you must be aware of the film’s history to enjoy it. A score of 7.5 on IMDb certainly says that those who seek this out understand its place in history. The story isn’t particularly interesting, the acting isn’t great, the makeup is a weird mix of silent and realistic stylings. Further, the microphones had to be placed in the scenes to record sound and the cameras were so loud that they had to be enclosed in a contraption to keep the microphones from picking up their noise. As a result, the camera never moves. We get a series of establishing shots, two-shots and close ups all edited together. There is never any camera movement. There are some interesting looking exteriors, but those exteriors don’t have anything resembling good sound. And, again, all of this conversation revolves around innovation and technology. The story of the movie is secondary. As the cops show up at The Hawk’s club and move his obviously fake wall to reveal a hidden compartment behind, we know that we’re watching this for the history of it, not the entertainment of it. Sure, there are some interesting shots. The shadowy moment which depict the death of a cop recalls German Expressionism and predicts Film Noir. Another shooting later feels similar to Hamlet’s assassination of Polonius from behind a curtain. That latter moment brings the cops in at an inopportune time to add a nice level of suspense, the kind of suspense Hitchcock would later exploit in a movie like ROPE. But to assign such lofty allusions to this film is to give it credit we want it to deserve rather than credit that it does deserve. Recently, a time capsule was pulled from the cornerstone of the Massachusetts Statehouse. That capsule was originally created by Paul Revere and Samuel Adams. The contents inside, some coins and some newspapers, are not interesting in a vacuum. But to consider these items as having been placed by historical figures who helped form our country 240 some odd years ago? That gives those items meaning. That makes those pieces of metal a particularly unique value. That makes those preserved pieces of paper an item of history. LIGHTS OF NEW YORK is important in a less important way. The scores below consider its value in terms of how a filmmaker might make a movie today, how entertaining it could be, and how well acted and how well written it might be. A modicum of bonus will be added for its history. But to watch this movie and pull something from it is not dissimilar to how you might consider a time capsule from two and a half centuries ago. The value of it may just exceed the raw materials from which it is made. As might be expected, that bonus point, as little as it pulls up the overall score, gives some small nod to where LIGHTS OF NEW YORK stands in history. ~ by johnlink00 on January 8, 2015. I know a lot about film, but honestly I didn’t know any of this. I knew about the Jazz Singer and I think one before that that experimented with sound. However, I didn’t know this film and what it did. Thanks for the post. Learned something new today. I didn’t know about it at all until I stumbled on it either. So we both got to learn a little!